Voice4u iOS Version-2.0.0: One App Fits All! Finally, version-2 is out and waiting for download. We put together millions of feedback from our friendly customers into this brand new version of Voice4u. It is optimized for all iOS devices and unlocks so many wonderful new features. Check it out now! Voice4u has become a universal application. A universal application is a single app that is optimized for iPhone, iPod touch, and iPad devices. 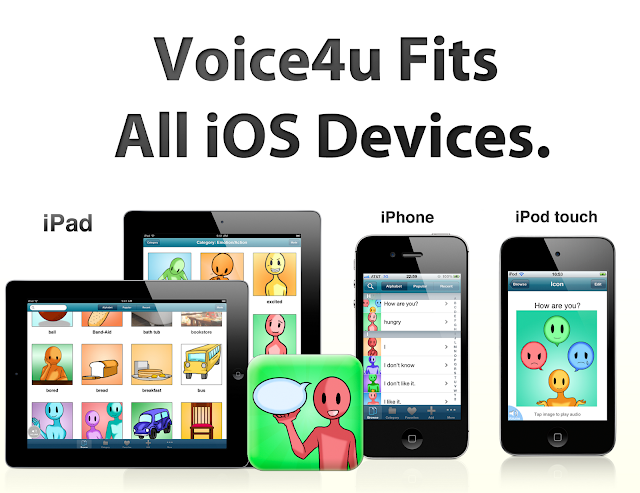 Previous versions of Voice4u used to run on the iPad in compatibility mode. When you install (or update) the new version of Voice4u onto your device, the program automatically detects the type of device and will run the designated system. The new Voice4u on iPad is designed for both horizontal and vertical screens. You can use Voice4u in any orientation even when adding a new icon. Thanks to quite a few feedbacks, Voice4u gained the ability to manually change the order of icons or categories. In previous versions, we had to tweak the word/phrase of icons to sort them, for example, “1 Wake up”, “2 Eat breakfast”, “3 Go to school”, “4 Study”, … and etc. You don’t need to do so anymore! With this feature, creating a schedule, recipe, or social story will become much easier. You can also switch modes between “Multi Mode” and “Single Mode”. By activating the “Multi Mode”, you can use multiple icons on a single screen WITHOUT switching screens. Take a look at this short video demonstrating this feature. Here are some highlights we previously shared. In case you missed out, check it out now! If you already own Voice4u, you do NOT need to purchase Voice4u again. This update is FREE as usual. If you buy Voice4u for the first time (after the new version is available), you can install it onto multiple iOS devices (iPad, iPhone, and iPod touch) with a single purchase. For schools or therapists who need to take care of a lot of Voice4u users, we suggest to look into the Volume Purchase Program as an option. I recently purchased Voice4u JP for my friend and spent hours putting in the names of her friends and favorite places etc for her iPad. I was very excited about the recent update and its new features – especially for the new iPad layout. However, when I installed it, every time I selected a card I had made in the previous version, the app crashed. The pre-installed cards don’t crash. I assume this is a bug that many others are experiencing. When might it be fixed? We hope you and your friend would be happy with the latest update, version-2.0.1!